Google Assistant has become increasingly popular over the last 12 months. This continues growth would capitalise on the opportunities posed by Google Assistant, and therefore it comes as no surprise that the search engine are trialling the delivery of ads in Google Assistant results. Several advertisers have argued that Google Assistant could destroy traditional search results. Google Assistant is now being used on over 1 billion devices, and we are seeing more and more people use it for searches. This aside, there are still no official figures detailing the potential PPC revenue that can be gained or lost. This provides fair reasoning behind the trial. For advertisers, this poses potential for a new paid search opportunity. 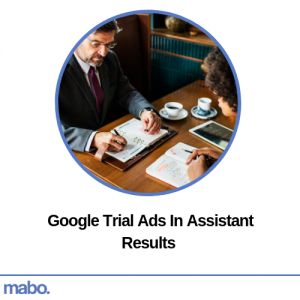 Although this trial is just in its infancy, should it be successful we can anticipate a formal rollout of paid-search ads within Google Assistant to eventually follow.